A well-defined, strong web presence makes generating leads simple. 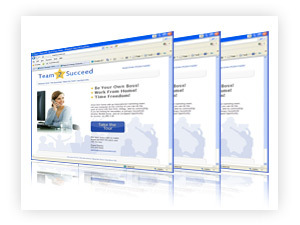 Replicating Website Software makes it easy for you to quickly develop the web presence you need! Home Office Pro self replicating website software offers both packaged replicating website software, as well as complete custom solutions to better suit your online efforts. Our lead capture page designs are customized to target the leads you need to best grow your business. Our skilled team of Marketers, Designers, and Programmers ensure that your experience working with us and creating your self replicating webisite is both memorable and profitable.Your replicated websites and network marketing software allow you and your business partners to easily duplicate success! We at the Platinum Synergy Group have many years of experience building successful online campaigns and data systems to provide turn-key pre-qualified leads for our many customers. Support and customer service are top priority with us. We believe in supporting not only our direct customers, but also the customers of our customers. When creating your online presence and self replicating websites, we take in to consideration the psychological, demographic, and behavioral patterns of your target market to ensure the leads that you are receiving are of the greatest quality.